Ditch the usual sit-around-and-do nothing party in favour of paint parties that will be organised by Paint Bar. It’s more therapeutic than you think! 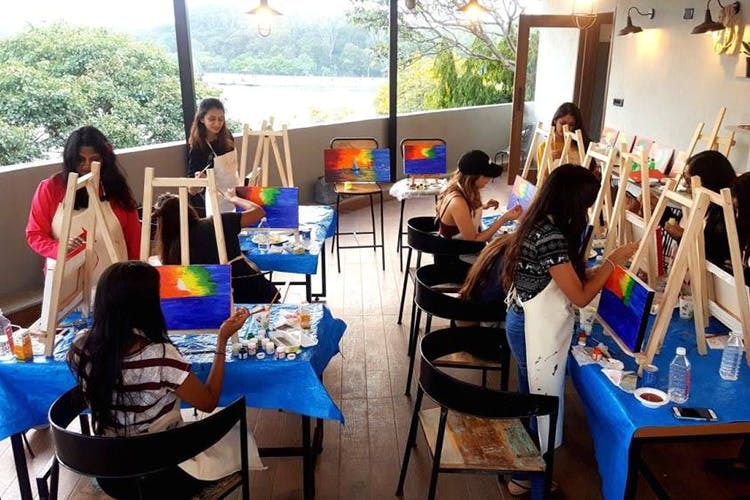 Essentially a series of workshops across the city, at cafes, restaurants and co-working spaces, Paint Bar was started by Nishka Mehta, an artist, and Chandana Sahukar, an art appreciator. And they’re here to tell you that everyone can paint. Luckily, they haven’t seen my art, or they’d have made an exception! Starting off from an idea of what Nishka saw in Boston, the ladies decided to bring the same kind of experience to India. And in only 8 months of existence, the duo has curated over 600 paint parties. They once did a Game Of Thrones event, and we’re still gawking at the art that came out of that one. If you’re like me and can’t paint to save humanity even, fear not, they will give you detailed instruction about how you can get your painting to look like Salvador Dali did it. Or they try to at least! Most events last two hours, with an hour allocated to painting and the rest setting up and taking photos so you can show off. You can take your masterpiece home, and get it framed if it’s good too! It’s simple enough to go about as well. All you need to do is fix a date, pick a location and call Paint Bar. They’ll show up with their Paint Truck, loaded with all the materials for you to create and take home a painting. From the canvas (or other material that you paint on), acrylic paint and brushes to easels, and aprons, they will even tarp the tables you provide, to save them from a dramatic spill of colours. Therapeutic, unique and fun, one particular image picked for each session so that everyone is on the same page (canvas?). The artist paints the same picture too, so you can literally follow every stroke and replicate the painting if you’re not a natural. And there’s always some music, food and drink to set the tone for the paint party. What’s a party without music eh? So next time you’re having a party, call these guys, it’ll be a riot of colours, for sure! They organise parties for kids too, so adults, you’re not the only lucky ones.